I've had most of the blocks finished and I had the white Kona Cotton. Unfortunately, I had stolen some of the Kona Cotton for other projects and had to buy more. Would you believe that my Joann's only had two yards. I used that up and went back the following week and they were out. So, I went down the street to Hancock Fabrics and bought enough to finish setting the blocks. 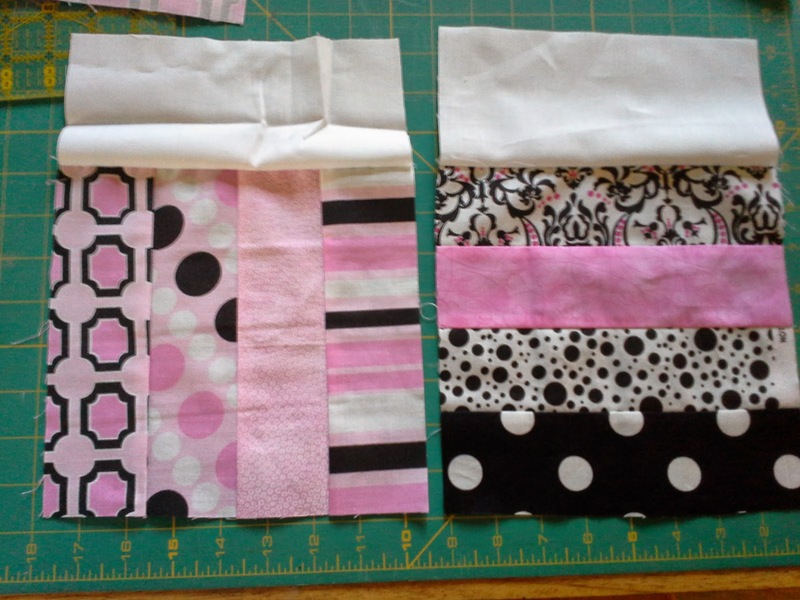 Sewing together the 2 1/2" jelly roll strips. Attaching the white strips to the horizontal and vertical blocks. The blocks started with a sketch from a quilt I saw years ago. 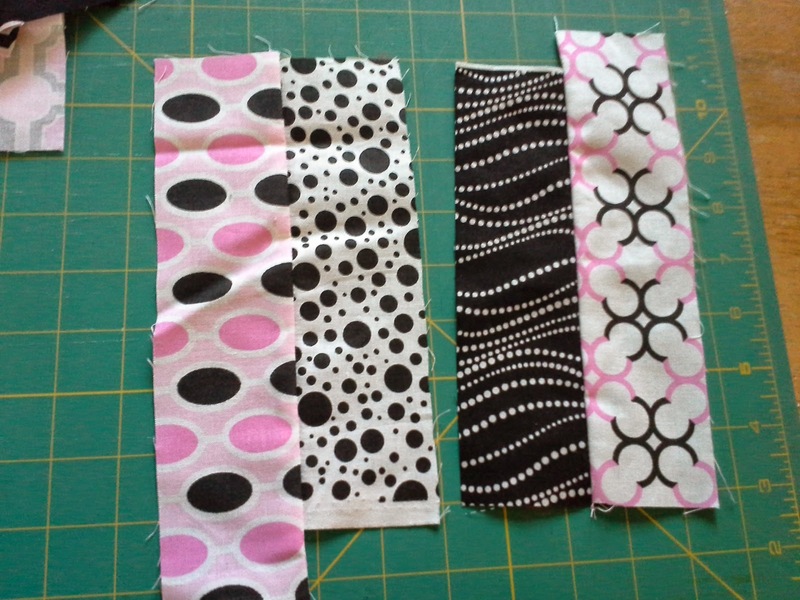 They were made from some jelly rolls--2 1/2 inch strips, supplemented with some fabric from my stash and from Joann's. I made the strips about 8 inches long and attempted random placements. Random is really difficult for me. I ended up making many extra squares to avoid similar placement. I made the blocks with four strips each. I had a hard time deciding how large the white strips between the blocks should be. I ended up making a spreadsheet to play with the numbers. I know. I'm a geek. 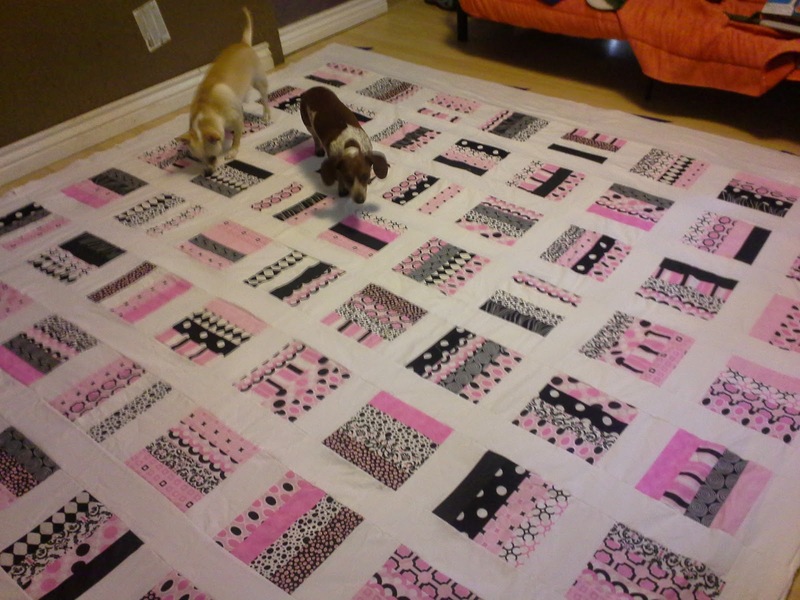 But it really helped me determine how many blocks and the width of the white strips to create a queen size quilt that would also fit onto the Warm and White queen size batting that I bought for this. Putting the block strips together. I sent this out on Instagram as my surprise project. Of course, at that point, I thought it would be done sooner. I believe that the white strips were cut as 4 inches with 1/4" allowance on each side. The blocks were rotated vertically and horizontally. I sewed 8 inch lengths of white to each block before sewing the block and white combos into strips of eight plus an extra length of white. 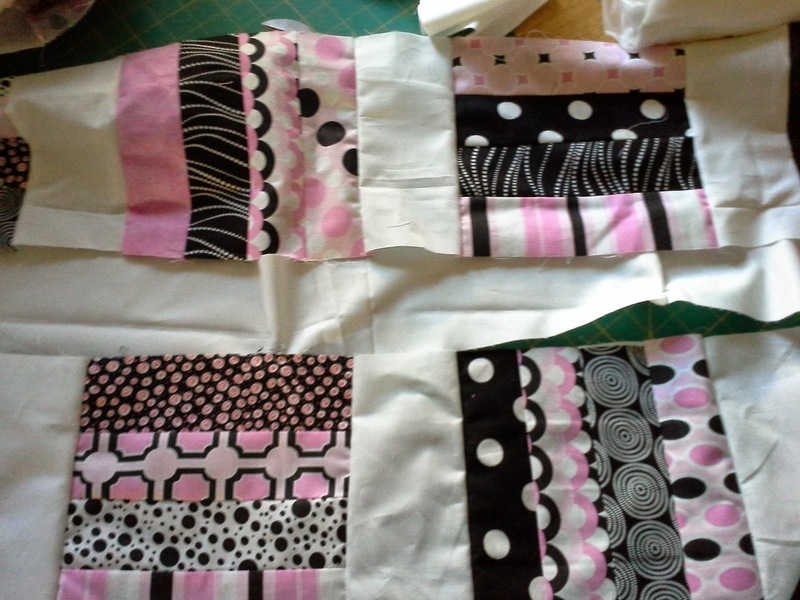 Then I sewed the block strips together, being sure that the blocks were still rotated horizontally and vertically. These long strips were really hard on my hands and wrists. It is also amazing how hot it can get while sitting at a sewing machine. Using the iron to press each seam is also a bit warm. One reason I make sure to make a quilt each year is that it makes me move the furniture and do a good floor cleaning in the family room. After a good sweeping, I follow with a really good floor scrubbing so that I can make my quilt sandwich. The quilt backing taped face down on the very clean floor. The batting placed on the backing. Bugg is inspecting the batting. The quilt top placed right side up on the quilt sandwich. to secure all three layers. Bugg and Ollie are making final inspections. The backing for this was a black and white zebra print. 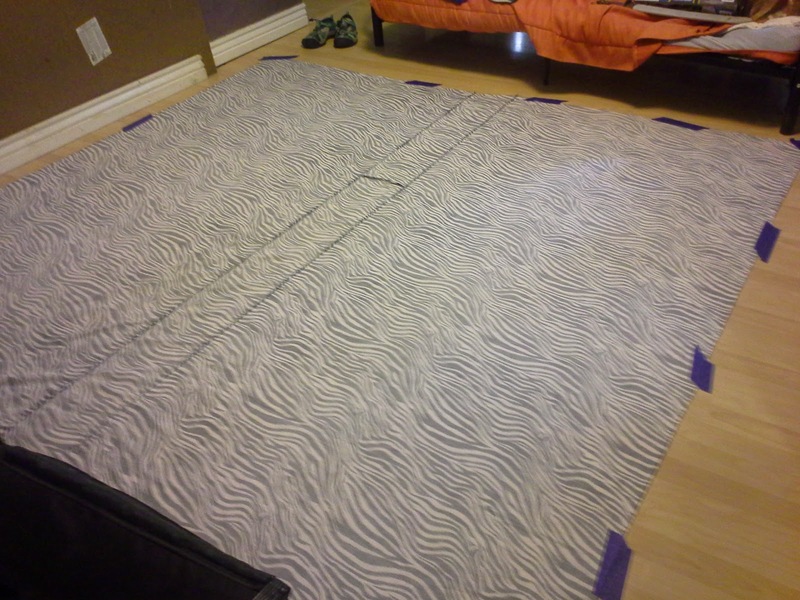 I had to add a strip of additional fabric because the two widths were not wide enough. I also used the same black and white zebra stripe for the binding. 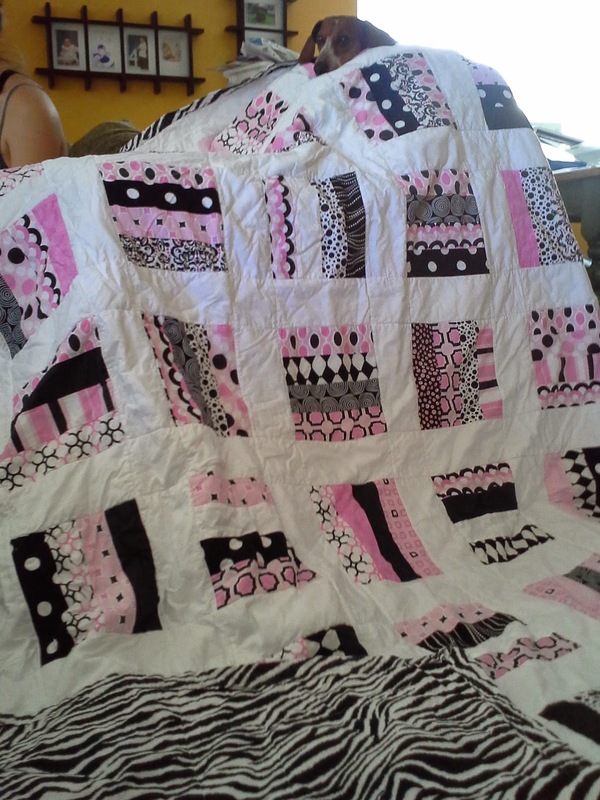 To make the quilt sandwich, I put the backing (zebra fabric) face down. I used painter's tape to hold it down after getting it wrinkle free. Then, the batting, followed by the pieced quilt top. I then spent about 45 minutes getting everything smooth and wrinkle free while using safety pins to hold the layers together. 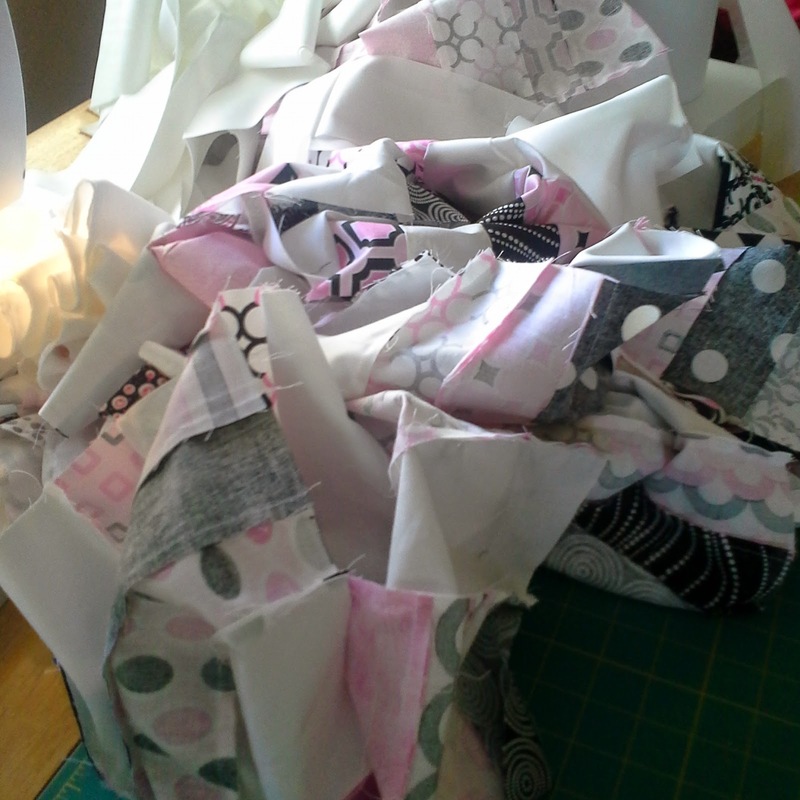 Quilting a queen size quilt on the dining table. My original plan was to quilt using a puzzle piece design. However, as time kept whirling by, I realized I should just stitch in the ditch. Or, as I do much better, near the ditch. 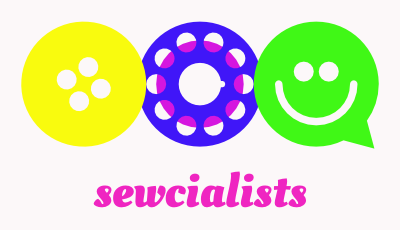 One of the best part of sewing for non-sewists is that they don't notice the crazy, swerving, uneven stitches--at least until they read this. Well, after everything was quilted together, I started designing a quilt label. The first few were too big. I'm having a software issue that thinks I'm using a crazy small screen so I cannot tell how big until I print out the design. I finally had a perfect design and it stitched out beautifully. I started trimming it so that I could put it on before attaching the binding. I ended up cutting through it, making it unusable. I attempted to stitch it out three more times. It kept having a problem on the same part of the quote that encircled around the main information. I finally, decided to ditch the quote and just do the main information. Once the label was hand stitched in place, I stitched the border and immediately put it into the washer on hot to shrink it up. I fell asleep before putting it into the dryer and had to re-rinse before putting it in the dryer on hot. Sarah finally got her birthday quilt. I'm now hoping she will retire her 19 year old Pocahontas comforter that she still uses. You created such a beautiful quilt! 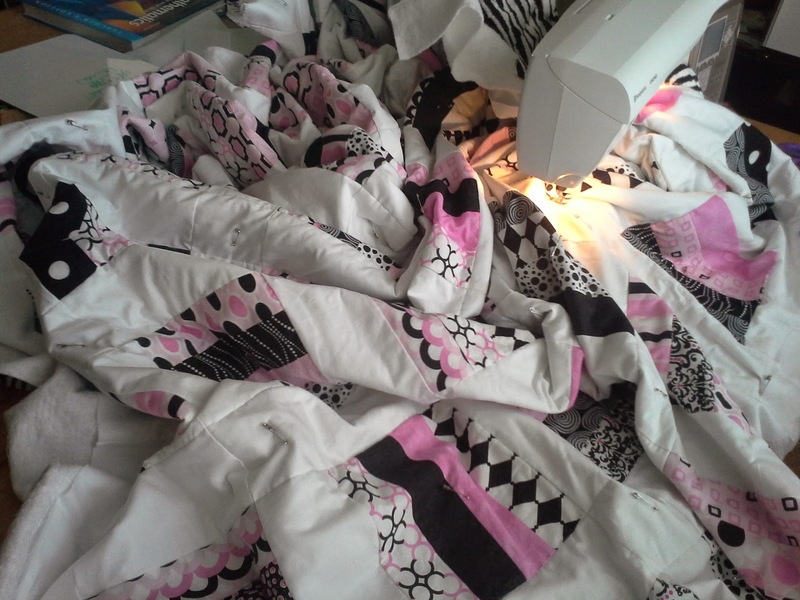 I have only sewn one quilt before (a crib size), and I remember what an ordeal it was, and how tired I was when I finished it!! But, the end result is always worth all the toil! Especially for a birthday! Thanks, Vanessa. The crib size are so very satisfying. I'm trying to design a crib size. That will be quick and easy compared to this one. Nine year old Youngest Son has a newly decorated room and has requested a new quilt. That will be twin or double size. It won't be a secret and I will share the details. It's good to have you back! That is such a beautiful quilt. I can just imagine the amount of effort and time it takes to make one, especially this size. 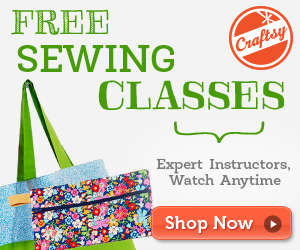 I'd love to learn how to quilt too, someday. That is a beautiful quilt! Your daughter will always appreciate the love, care and memory of it! Your doggies are so cute. Your quilt is so pretty! Love your fabric choices. I'm sure your daughter loves it.